In case you hadn't heard yet, technology has finally made itself useful with the world's first cupcake vending/ATM machine. 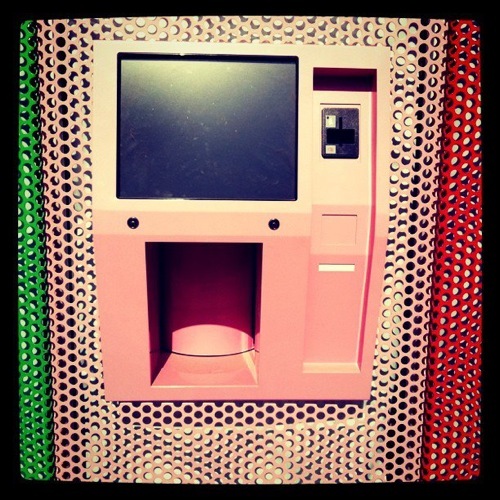 The folks at Sprinkles Cupcakes in L.A. have debuted the world's first cupcake automat, with this pretty pink vending machine delivering freshly baked cupcakes, cupcake mixes, apparel and even cupcakes for Fido! (Via designtaxi.com). This is so crazy and weird... but cool! I would die for a Sprinkles cupcake right about now. No WAY!!!!! Greatest invention EVER. In the history of the world. I just read this in the LA Times! I wonder how fresh they'll really end up being and if its possible to pay with a handful of quarters. haha. I'm going to have to move to L.A. now! OMG! this ATM needs to open up in NY. ASAP!